Snow and ice on a Des Moines home. After two big blizzards in two weeks, the roofs of at least two businesses in the Omaha-Council Bluffs area collapsed last weekend under the weight of heavy snow and ice. Jeremy Bleeker, a general contractor and certified roof inspector, says Iowa homeowners who are concerned about the snow on their roofs might be able to take care of the situation themselves. The roof rakes often telescope and should be used from the ground. Bleeker says it’s not wise to climb onto the roof itself to remove snow. 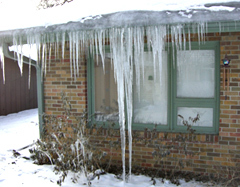 Most homes in the Midwest are built to withstand the weight of a heavy snowfall, but Bleeker says problems arise with what are known as “ice dams” which can lead to very damaging leaks caused by melting snow. “When you melt it, it doesn’t have a chance to evaporate so it will flow down, underneath that snow layer, until it hits the cold portion of your house which is your eaves,” Bleeker says. “The coldest portion is your overhangs, that’s where it will freeze and create that dam where it holds water back. 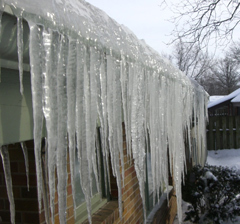 Then that water will start to back up underneath your shingles.” He says one cause is poor insulation which allows heat to escape through your roof, melting the snow which pools at the roof’s edge and re-freezes, creating the dam. Bleeker says the building code is now R-38 but many homes are only insulated to R-19. Upgrading the insulation in your home is often a $700 job but he says many utilities will pay homeowners back or offer a rebate for a portion of that cost. He says the deterioration of shingles will be accelerated by having snow and ice sitting on your roof.